Cook the farro or pearl barley according to package directions. 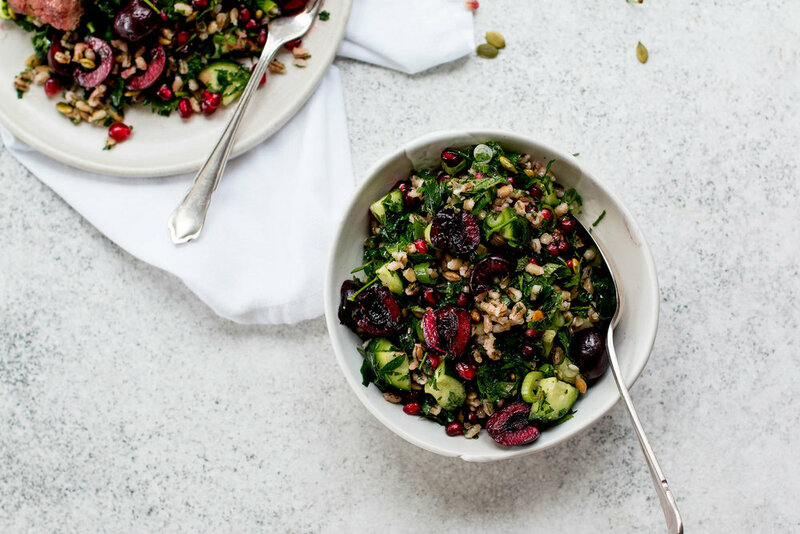 In a large bowl, combine parsley and mint with pomegranate seeds, pepitas, scallions, cherries, and cucumber. Mix thoroughly with cooked farro or pearl barley. Pour lemon juice, olive oil, and pomegranate molasses in a small jar and shake to mix. Pour dressing over the salad and toss to combine. Season with salt and pepper to taste. Season the meat with salt and pepper and rub with olive oil. Pan fry over medium-high heat on an oiled cast iron skillet until desired doneness. Alternately, cook meat on a barbecue. Serve the cherry tabouli topped with seared steak. Recipe created for Nature's Partner by The Brick Kitchen. In a small bowl, sprinkle gelatin over 1/2 cup cold water; let soften. Meanwhile, place grapes, sugar, and 1 cup water in a medium saucepan. Bring to a boil; reduce heat, and simmer, mashing occasionally with a spoon or potato masher, until grape skins are loosened, 10 to 15 minutes. Stir in softened gelatin until dissolved. Strain mixture through a fine-mesh sieve, pressing to extract as much liquid as possible (add water if necessary to yield 3 cups); discard solids. Divide mixture evenly among four serving glasses; refrigerate until set, at least 2 hours. In a small bowl, stir together sour cream and honey; spoon over gelatins, dividing evenly, and spread gently to edges. Serve immediately or chill up to 2 days. Just before serving, garnish with halved grapes. Puree kiwifruit, lime juice, and tarragon in food processor until just blended. Do not crush kiwifruit seeds. Heat water, sugar and corn syrup until sugar is dissolved. Remove from heat and cool. Stir pureed kiwi into sugar syrup mixture. Pour into ice cream maker and freeze following manufacturer’s directions. Serve garnished with fresh kiwi slices. Makes 4 (3/4 cup / 175 ml) servings. Preheat oven to 400°F. Line a cookie sheet with sides with parchment. On the sheet pan toss the squash with the oil, cumin, red pepper flakes and salt and pepper. Spread into a single layer and roast until tender and browned, 25 to 30 minutes. Let cool 15 minutes. While squash is roasting, whisk together the yogurt, tahini and lime juice. Season with salt and pepper and 1-2 tablespoons water. Mix the grapes and cilantro in with the squash and transfer to a serving dish. Drizzle with the dressing and serve squash with the remaining dressing on the side. Peel and slice the green and gold kiwifruit. Place the green kiwifruit in a food processor or blender with 1-2 tablespoons of orange juice. Process until just smooth, taking care not to crush the seeds. Pour into one or two long glasses. Place the gold kiwifruit into a clean food processor or blender with 3-4 tablespoons of orange juice and purée, until just smooth. Carefully pour the purée over the back of a spoon onto the top of the green purée. Purée the raspberries with 2 tablespoons of orange juice, until just smooth. Pour over the back of a spoon onto the top of the gold purée. There should be three distinct layers. Serve immediately. Place flour, butter and salt together in food processor and process until the mixture resembles fine meal. In a small bowl blend egg yolk and crème fraîche together. Add egg mixture and process until dough barely comes together. Wrap in plastic wrap; refrigerate for 2 hours or up to 3 days. In a large sauce pan bring 5 cm of water to a boil; reduced to simmer. In a medium bowl place eggs, kiwifruit puree and beat until light and fluffy. Add sugar, lime juice and lemon zest. Place bowl over the saucepan, making sure the bowl doesn’t touch the water. Cook until the curd is thickened, beating occasionally. Remove from heat and beat in butter; one tablespoon at a time. Let the curd cool to room temperature, cover and freeze overnight or up to three days. In a small bowl mix the 1 ¾ cups (475 ml) kiwifruit puree with the corn syrup to make the sauce. Preheat oven to 375ºF (190ºC). Flour a work surface. Roll out pastry dough to 1/8 inch (3 mm) thickness. Cut out 3 inch (7.5 cm) rounds. Transfer the rounds to 2 ½ inch (6.5 cm) tart shells and prick them with a fork all over. Bake until they are golden brown, 12 to 15 minutes. Let cool. May be made 3 days in advance. Up to 6 hours in advance arrange pre-baked tartlets on cookie sheet. Using a small ice cream scoop (#40) place a ball of kiwi curd on top of each tartlet. Freeze until needed. In medium bowl beat egg whites until foamy, add sugar and continue beating until stiff and glossy. Transfer to pastry bag fitted with a small plain tip. Pipe meringue, spiraling around and up the kiwi curd forming a dome and gradually enclosing the top to create a beehive. Heat the broiler to very hot (or use the kitchen torch) and broil briefly until the meringue is lightly browned all over. Spoon kiwifruit sauce on each plate. Place beehives on top of sauce and serve immediately. Pulse grapes in a food processor until coarsely chopped and remove to a bowl. Stir in scallions, green chiles, jalapeño, vinegar, lime juice, mint, and salt. 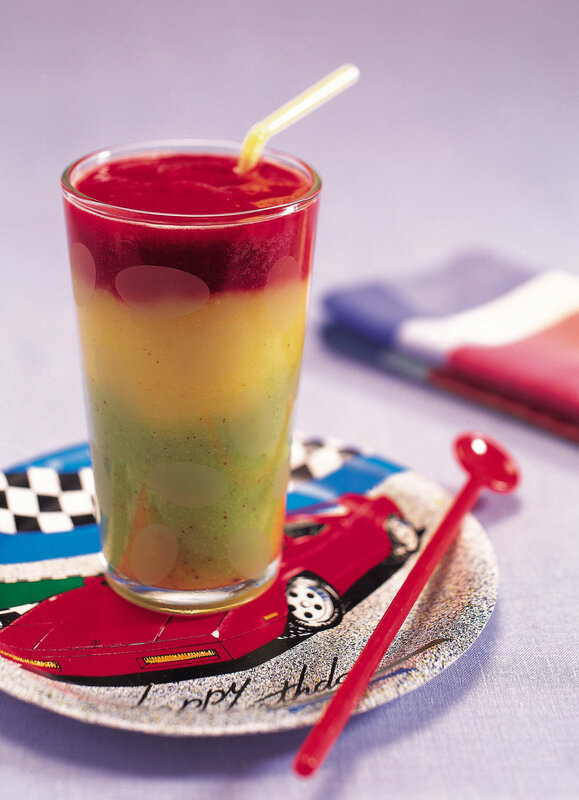 Recipe courtesy of Fruits from Chile. Wash and thoroughly dry all grapes. Set aside. Make a simple syrup by bringing water and ultrafine sugar just to a simmer in a medium saucepan. Stir until sugar has dissolved completely. Let syrup cool completely, then add grapes to the syrup and stir to coat. Refrigerate grapes in the syrup overnight. Line a large baking sheet with wax paper. Liberally, sprinkle ½ cup white granulated sugar over the paper-lined baking sheet. Roll grapes in the sugar to lightly coat them with the sparkle-y sugar. Use additional sugar as needed. Let sugared grapes dry for one hour before serving. Preheat oven to 425°F. Toss grapes with oil and salt and arrange in a single layer on a baking sheet. Roast until the grapes have begun to burst, about 10-15 minutes. Stir together yogurt, honey and orange zest. Divide yogurt among serving bowls and top with granola and roasted grapes. In a cocktail shaker, gently muddle the grapes until they burst. Add the remaining ingredients and enough ice to fill a rocks glass and shake well for 20 seconds. Pour the contents of the shaker into the rocks glass. In a non-stick skillet over medium high heat add chorizo, allowing some of the oils to come out. If needed, add a tablespoon of olive oil. Add grapes, oregano, and thyme. Continue to brown the sausage and wilt the grapes to allow their natural juices to seep out. Grapes will start to pop, so monitor as the cook. All this should take about ten minutes. Remove chorizo and grapes from the pan and put on a serving dish. Add wine to the pan and scrape down the bottom of the pan to release the drippings and flavoring. On low heat, reduce the wine slightly, then add the butter, one tablespoon at a time. Whisk the sauce until it reaches a rich glaze. Pour over sausage and top with parsley. Use as a side dish, as a filling for pita, or roll into tortillas for a party snack. Created by Kelly Springer MS, RD, CDN, www.kellyschoice.org for Chilean Fresh Fruit Association. Muddle 3 grapes with the simple syrup. In a separate shaker, dry shake egg white. Add ice to the muddled grapes. Pour already shaken egg whites over. Shake well, strain over ice, and add 1 dash of bitters. In a large saucepan, melt butter. Sauté onions and garlic. Add chicken broth. Bring to a boil. Add wild rice. Reduce heat to a simmer. Cover and cook 30 minutes. Mix in long grain rice; cover and simmer another 30 to 40 minutes. Until rice is tender and liquid is absorbed. Remove from heat, stir in grapes, parsley and pecans. Season with salt and pepper. Serve stuffing warm as a side dish or stuff in a Turkey. Line a baking sheet with parchment paper. Spread the cherries out in an even layer on the sheet. In a small cup, mix together the honey, balsamic, and olive oil. Toss thoroughly with the cherries. Sprinkle cherries with the rosemary and season with black pepper. Roast for 15 minutes until softened. Set aside in a bowl. Meanwhile, toast the slices of sourdough under a grill until golden brown. Rub with the cut side of the garlic clove while hot. 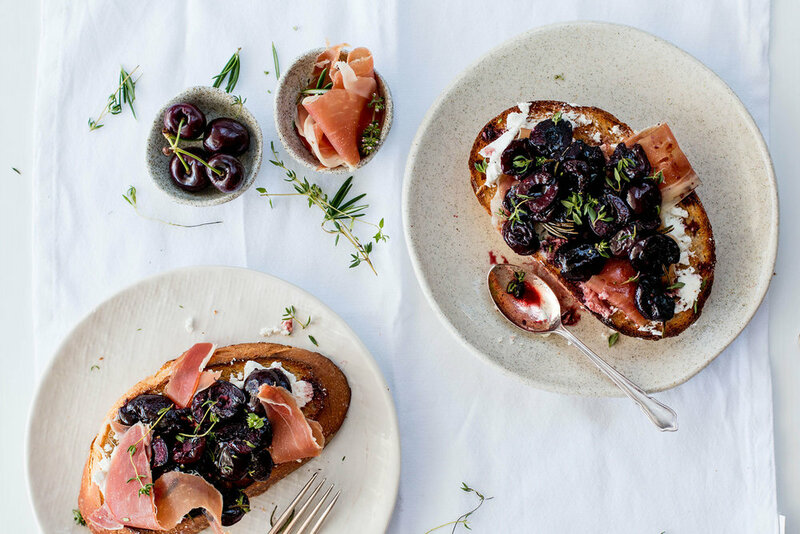 Serve garlic-rubbed bruschetta with fresh goat cheese, roast balsamic cherries, prosciutto, and salt and pepper. Combine the shrimp, salmon, scallops, white fish, red onion, Jalapeno peppers, red pepper flakes and lime juice. Marinate refrigerated for 2 ½ to 3 hours. Just before serving, drain off excess lime juice and add tomatoes, cilantro, sugar, salt and pepper. Carefully add in the kiwifruit, lime and orange segments and gently mix. Serve on bed of lettuce leaves. Makes 16 (½ cup) servings. Mix the honey, lime juice, chilies and chosen herb in a bowl and add the gold kiwifruit. Marinate for 30 minutes before using. Spoon into the centre of halved avocados or use as a dressing on an avocado and chicken salad. Prepare farro as directed on package, toss with salt and pepper and cool. While the farro is cooking, toss 1 cup of the halved grapes with 2 tablespoonsolive oil, salt and pepper. (reserve remaining 1 cup of grapes for later) Place inbaking dish and roast, in a 350F oven, for approximately 20 minutes, or untiltheir juice has been extracted and grapes are soft. Remove from oven and allowto sit at room temperature. Heat 2 tablespoons of olive oil in a sauté pan. Add onions and sauté overmedium heat until soft and slightly browned. Add salt and pepper to taste. Setaside to cool. Mix vinaigrette: In a bowl, whisk together vinegar, pomegranate molasses,mustard and juice from roasted grapes. Whisk in olive oil in a thin stream untilemulsified. Whisk in salt and pepper to taste as well as chopped rosemary. Toss salad: Place sautéed onions and roasted grapes into bowl with farro. Addhalf of the vinaigrette and the parmigiano cheese. Toss to coat evenly. Add in 1cup uncooked, reserved, grapes. Toss in greens. Add additional vinaigrette, asneeded. ** Taste and add salt and pepper to needed. Serve immediately. *If using hearty greens such as kale or cabbage, you can toss the salad while the other ingredients are still warm. Hearty greens are also recommend if you are making this salad in advance or if it will be sitting out for a while. ** Farro tends to soak up the dressing, you will need more vinaigrette than with other salads. To save time, could also use a prepared vinaigrette. Cut tortillas into triangles. Place on a baking sheet and bake for 8-10 minutes, until brown and crispy. Bake Brie until soft and melted about 5-8 minutes. 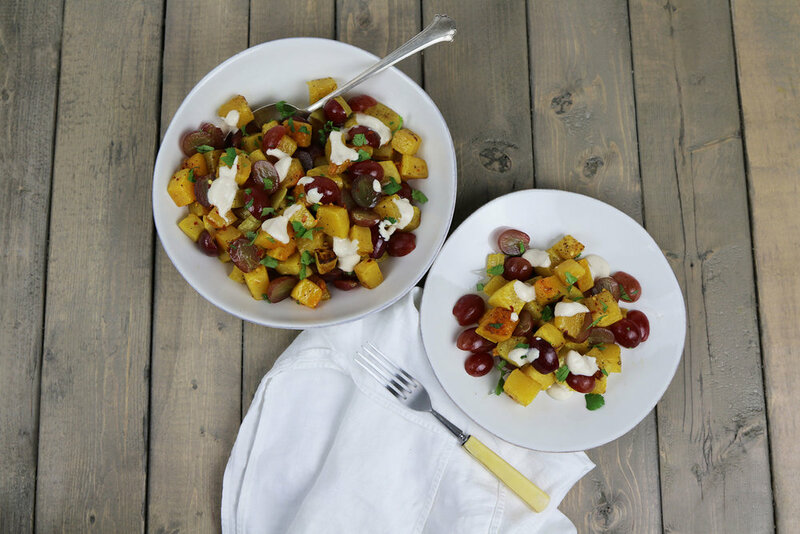 Serve the grape salsa from a bowl or spoon it over the top of the warm brie. Created by Jill Melton MS, RD, www.jillcookshere.com for Chilean Fresh Fruit Association. To make the brioche, melt the butter in a medium pot. Add the milk and heat until lukewarm. Sprinkle the dried yeast over the milk mixture, cover, and set aside for a few minutes to activate yeast. Meanwhile, whisk together the eggs, sugar, and salt in a large bowl to dissolve the sugar. Pour the yeast mixture into the eggs and stir to combine. Add the flour and stir well. Mix with the dough hook attachment of a stand mixer on medium speed for 8 minutes. Alternately, vigorously stir the mixture by hand with a metal spoon for about 10 minutes until it becomes glossy. The finished dough will be very sticky and will not hold together in a ball. Do not add more flour! Loosely cover the bowl with cling wrap and refrigerate overnight. In the morning, preheat the oven to 375°F and line a baking sheet with parchment paper. Divide the dough into 8-10 even pieces; roll out into circles ⅓” thick. Transfer to the baking tray. Fold the outer edge (about ½”) in toward the center, creating a rim. Cover with a clean tea towel and leave to rise for 15 minutes. Meanwhile, combine the halved fresh cherries with 2 tablespoons granulated sugar and stir to combine. 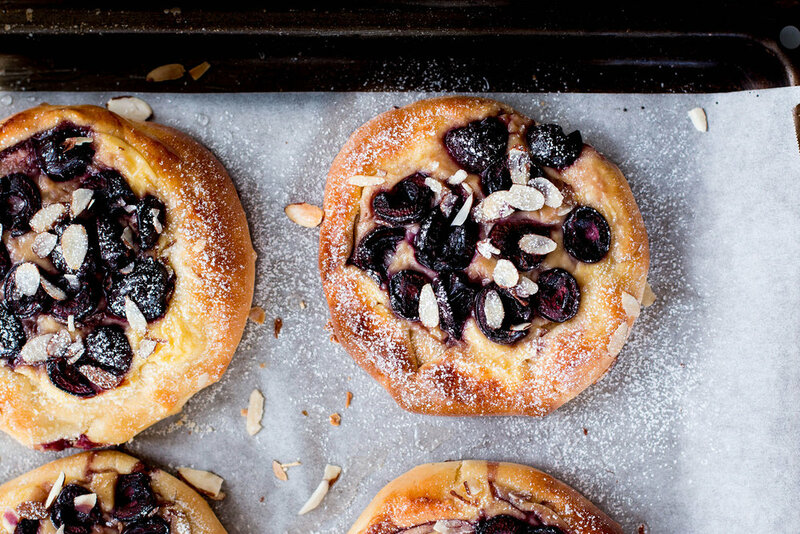 Sprinkle 1 tablespoon of almond meal into the center of each brioche, right to the rim. Spoon about 2 tablespoons of vanilla custard on top of each and spread evenly over the almond meal. Divide the cherries over the vanilla custard. Top with a sprinkle of flaked almonds. Bake for 20-25 minutes or until golden brown. Meanwhile, in a separate bowl or stand mixer beat together the remaining half of the granulated sugar, egg yolks and cornstarch until pale and thick. When the milk has just come to the boil, slowly pour half the milk mixture into the egg mixture, whisking constantly. Return remaining milk mixture to the heat and return to a boil. Quickly add the egg mixture to the pot of hot milk, whisking constantly. Keep whisking vigorously until it thickens and returns to the boil. Pour into a bowl and lay a circle of baking paper on top so it does not form a film on the surface. Will keep in an airtight container in the fridge for up to 3 days. Whisk until smooth before using.